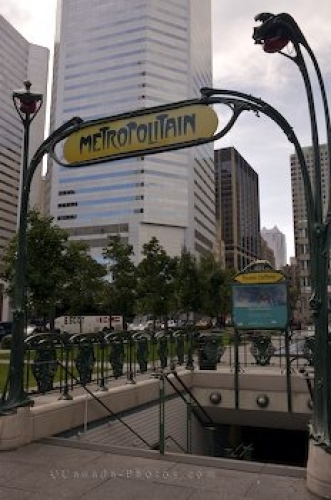 The yellow sign in Square Victoria in Montreal, Quebec marks the entranceway to the Montreal Metro. At Square Victoria in Montreal, Quebec, people can board the metro which is known as the orange line at this location where the sign is displayed. The central mezzanine of the metro station is joined together by a long tunnel which runs under Square Victoria where people can disembark through a variety of exits. The exits are all connected to buildings in the underground world and once you emerge up the stairs, there is a big beautiful city around Square Victoria. Entrance to the Metro Station from Square Victoria, Quartier International, city of Montreal, Quebec, Canada. Picture of the metro sign at the top of the stairwell at Square Victoria in Montreal, Quebec.